Former Washington Post reporter Jason Martin knows there’s something secretive going on in the high echelons of politics, and he’s determined to find a way to prove it. Beautiful and naïve Dorothy Curtis becomes the key to Jason’s plan, which he hopes will put them both back on track. Can he give the sextet of the most powerful men in Washington an expiration date on their greedy endeavors? When Dorothy’s body is found at the bottom of the Duke Ellington Memorial Bridge, everyone assumes it was suicide over a lover. But Fiona Fitzgerald, a top Metropolitan Police Department detective, has her doubts. Fiona knows that in this town, power and money come before love. Unfortunately, this death hits a little too close to home, and Fiona wrestles with her own feelings about love as she finds herself empathizing with Dorothy. When Fiona and Jason collide, the power lies in the truths they reveal, truths that will bring down the sextet and help them both come to terms with their own demons. 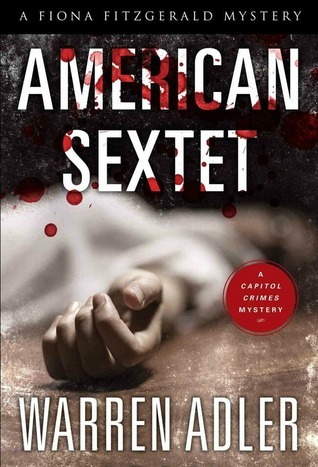 American Sextet is the second book in the Fiona Fitzgerald Mystery series. This book was a bit of an anomaly for me: this is the second book in the ‘Fiona Fitzgerald Mystery Series’ and frankly, I can’t stand Fiona Fitzgerald as a character. That’s not a slight to the writing in any way, she’s a fully developed character…. I just find her thoroughly objectionable. The story follows the investigation into the death of a sweet woman who has been involved in a series of affairs with the most powerful men in Washington. Her death appears to be a suicide initially, but Fiona suspects otherwise the more she looks into the circumstances surrounding her final plunge off a bridge. I found Dorothy, the victim, enchanting and lovely. This was due in part to the vocal talents of Lillian Yves, the narrator. She brings sweetness to an already lovely character and keeps you gripped, I was devastated to know from the beginning that Dorothy was destined to die and that there was nothing to be done. Fiona self-identifies with the victim on a certain level and seems to take the opportunity to completely over analyse her own relationships and bask in self pity. Screw you Fiona! Dorothy is the person to be pitied here! Fiona’s choice in men still hasn’t improved and she finds herself single again before too long…. I really do hope she redeems herself as the series goes on! Funnily enough, she didn’t play a huge role in this book so I didn’t find her too distracting.The supporting characters in this novel were excellent and provided the strength that she lacks. Lillian Yves brought each character to life in this book, with their own voice and subtlety. My interest was held right from the beginning and kept me hooked until the end, I would definitely like to listen to more of her work in future! If you’re a fan of mystery novel, especially those with a political slant, this is the book for you. If you do fancy have a read of this story, I would personally champion the audio version! As if we’re not getting enough politics in the UK just now! Seriously, though — it seems that the author is excellent at characterisation, if you feel so strongly in an opposite way about Fiona and Dorothy. Fictional politics are far better than the reality we’re facing today!